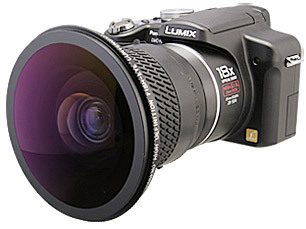 For shooting with Raynox DCR-7900ZD, DCR-FE181PRO or DCR-CF187PRO lenses mounted on Panasonic LUMIX DMC-FZ38, FZ35, FZ28, FZ18 camera, the Raynox Lens Holder RT5855W is necessary to be installed. As to the zoom range of the camera with the above conversion lenses on, it would be most appropriate and suggested to stay at the wide angle side of the zoom range. For example, with DCR-7900ZD it is limited at the widest angle side (1x), and at the zoom range of between 1x (wide angle end) and 3x (indicated in the camera) with both DCR-FE181PRO and DCR-CF187 PRO Fish-eye lenses. Zooming beyond that area would cost a proper shooting by touching the conversion lens to the camera lens. So, please pay a careful attention in zooming with the lens on. The DCR-7900ZD 0.79x wide-angle lens is a high definition conversion lens made to broaden the field of view when attached on the digital camera's lens, and it's fabricated with two of the high index optical glass, resulting in a high resolution power of 230 lines/mm at center (MTF30%) at center. It achieved the level of almost non-distortion, 0.9% rate. It creates an unusually fine and non distorted wide angle image. Raynox Model RT5855W lens holder is required for use with the DCR-7900ZD + Lumix DMC-FZ38, FZ35, FZ28, FZ18 camera. RT5855W lens holder is Not Included. DCR-FE181PRO lens captures an amazing ultra-wideangle view of 180 degrees on diagonal line. It's a completely new high definition lens made of the high index optical lens with a 4-group/5-element formula. Raynox Model RT5855W lens holder and RA6258 included adapter ring are required for use with the DCR-FE181PRO + Lumix DMC-FZ38, FZ35, FZ28, FZ18 camera. RA6243, RA6252, RA6255 and RA6258 adapter rings are Included. 1) Set the camera power " OFF "　and remove the lens cap from the camera. 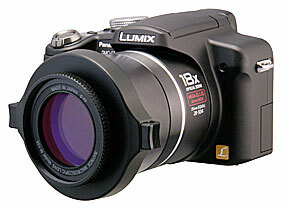 2) Set the camera power " ON " and confirm the master lens is set for maximum wideangle position. 3) Set the camera power " OFF "
4) Screw in RT5855W lens holder adapter onto the DMC-FZ38, FZ35, FZ28, FZ18 camera lens. 5) Mount the conversion lens onto the RT5855W lens holder adapter. 6) Set the camera power " ON "
Upon mounting on the zoom lens, The DCR-CF187PRO opens the field of view to the circular fisheye image. It's a completely new high definition lens made of the high index optical coated lens with a 4-group/6-element formula to obtain the maximum resolution power of 500 lines/mm at center (MTF30%), while it has low dispersion. Raynox Model RT5855W lens holder and RA6258 included adapter ring are required for use with the DCR-CF187PRO + Lumix DMC-FZ38, FZ35, FZ28, FZ18 camera. Lens construction: 4G/6E, made of optical glass lenses, all surfaces fully coated. Specifications For shooting with Raynox DCR-7900ZD, DCR-FE181PRO or DCR-CF187PRO lenses mounted on Panasonic LUMIX　DMC-FZ38, FZ35, FZ28, FZ18 camera, the Raynox Lens Holder, which will be available in late February 2008, is necessary to be　installed. As to the zoom range of the camera with the above conversion lenses on, it would be most appropriate and suggested to stay at the wide angle side of the zoom range. For example, with DCR-7900ZD it is limited at the widest angle side (1x), and at the zoom range of between 1x (wide angle end) and 3x (indicated in the camera) with both DCR-FE181PRO and DCR-CF187 PRO Fish-eye lenses. Zooming beyond that area would cost a proper shooting by touching the conversion lens to the camera lens. So, please pay a careful attention in zooming with the lens on. 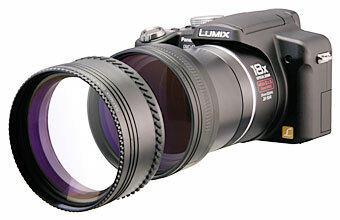 DCR-2025PRO lens extends the focal length of Panasonic Lumix DMC-FZ38, FZ35, FZ28, FZ18 zoom lens to 1100mm super telephoto ! (35mm film equivalent) It's a completely new high definition lens made of the high index optical lens with a 2-group/4-element formula. Model RA6255 Raynox adapter ring and Panasonic DMW-LA3 lens adapter are required for use with the DCR-2025PRO + Lumix DMC-FZ38, FZ35, FZ28, FZ18 camera. RA6255 adapter ring is Not included. DCR-2025PRO comes with 4-adapter rings for 43mm(RA6243), 52mm(RA6252), 55mm(RA6255), 58mm(RA6258) filter sizes and a LS-082 lens shade. The lens shade will cut an unwanted light beam, and it prevents flare and ghost image effect considerably. 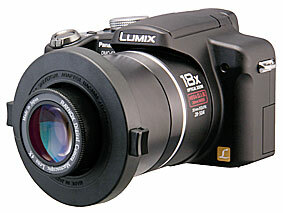 DCR-1542PRO lens extends the focal length of Lumix DMC-FZ38, FZ35, FZ28, FZ18 camera zoom lens to 640mm telephoto lens! (35mm film equivalent) It's a completely new high definition lens made of the high index optical lens with a 2-group /4-element formula. Model RA5255B Raynox adapter ring and Panasonic DMW-LA3 lens adapter are required for use with the DCR-1542PRO + Lumix DMC-FZ38, FZ35, FZ28, FZ18 camera. RA5255B adapter ring is Not included. The DCR-5320PRO Macro Close-up lens is made of two independent lenses of 2-diopter magnification and 3-diopter one, both fabricated in doublet formula for less color aberration at corners. By putting the two lenses together, it creates the high 5-diopter magnification macro close-up conversion lens with the excellent high resolution power of 200 lines/mm at center (MTF30%). Model RA7255 Raynox adapter ring and Panasonic DMW-LA3 lens adapter are required for use with the DCR-5320PRO + Lumix DMC-FZ38, FZ35, FZ28, FZ18 camera. RA7255 adapter ring is Not Included. 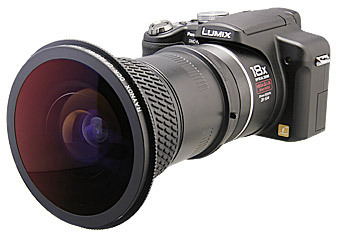 Panasonic DMW-LA3 lens adapter is required for use with the DCR-150 + Lumix DMC-FZ38, FZ35, FZ28, FZ18 camera. UAC2000 Universal adapter is Included in DCR-150. 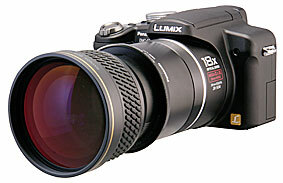 Panasonic DMW-LA3 lens adapter is required for use with the DCR-250 + Lumix DMC-FZ38, FZ35, FZ28, FZ18 camera. UAC2000 Universal adapter is Included in DCR-250. You can simply "Snap On" MSN-202 Super Macro lens onto the lens filter threads. (52-67mm) by using a universal mount UAC3500 and it will be able to take macro images with minimum distortion at the maximum telephoto position of Lumix DMC-FZ38, FZ35, FZ28, FZ18 camera. Panasonic DMW-LA3 lens adapter is required for use with the MSN-202 + Lumix DMC-FZ38, FZ35, FZ28, FZ18 camera. Lens construction: 3G/4E Optical coated glass elements. UAC3500 Universal adapter is Included in MSN-202. With MSN-505 Super Macro lens attached, the camera captures an intricate tiny object like 2mm x 1.5mm for a frame-filling enlarged close-up image from the distance of 18.5mm to the object at the infinity focusing position. You can simply "Snap On" MSN-505 Super Macro lens onto the filter threads of DMW-LA3 Lens Adapter by using a universal adapter UAC3500 and it will be able to capture macro images with minimum distortion at the maximum telephoto position of Lumix DMC-FZ38, FZ35, FZ28, FZ18 camera. 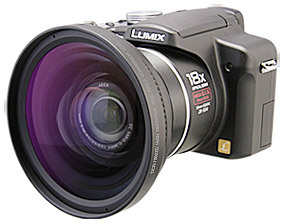 Panasonic DMW-LA3 lens adapter is required for use with the MSN-505 + Lumix DMC-FZ38, FZ35, FZ28, FZ18 camera. UAC3500 Universal adapter is Included in MSN-505. For shooting with Raynox DCR-7900ZD, DCR-FE181PRO or DCR-CF187PRO lenses mounted on Panasonic LUMIX DMC-FZ38, FZ35, FZ28, FZ18 camera, the Raynox Lens Holder RT5855W is necessary to be　installed. As to the zoom range of the camera with the above conversion lenses on, it would be most appropriate and suggested to stay at the wide angle side of the zoom range. For example, with DCR-7900ZD it is limited at the widest angle side (1x), and at the zoom range of between 1x (wide angle end) and 3x (indicated in the camera) with both DCR-FE181PRO and DCR-CF187PRO Fish-eye lenses. Zooming beyond that area would cost a proper shooting by touching the conversion lens to the camera lens. So, please pay a careful attention in zooming with the lens on. 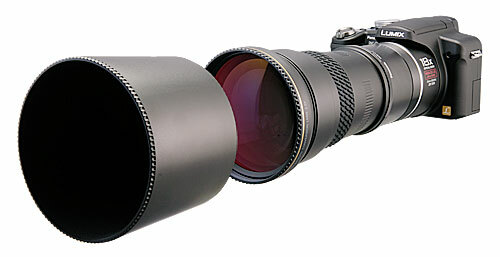 ● Raynox telephoto conversion lenses were designed to use at maximum Telephoto position of camera's zoom lens. ● While setting the camera at Macro Mode, the zoom range of getting sharp image without a vignetting (corner cutting) on the telephoto lens or macro lens attached is confined in the telephoto end area. ● The focal length of 35mm film equivalent on the conversion lens attached with DMC-FZ38, FZ35, FZ28 cameras will differ from the one obtained with DMC-FZ18. With DCR-7900ZD, it will be 21mm. DCR-1542PRO -748mm; DCR-2025PRO-1069mm. ● All of Raynox conversion lenses are proudly made in Japan. At our wholly owned manufacturing subsidiary, every stage of production is rigorously checked and tested so that the lens elements compensate effectively for astigmatism, distortion and spherical aberration.... for an excellent image quality. Use of adapters other than Raynox made may result poor resolution at the corners of the image.